The Phillip and Patricia Frost Museum of Science invites you to Big Bang: The Sixth Sense, A Celebration of Science After-Party Fundraiser. 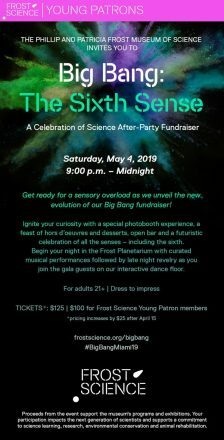 Get ready for a sensory overload at Frost Science as we unveil the new evolution of our Big Bang fundraiser, the official after party for the annual Celebration of Science gala. Ignite your curiosity with enhanced programming, a special photo-booth experience, a feast of hors d’oeuvres and desserts, open bar and a futuristic celebration of all the senses – including the sixth. Begin your night in the Frost Planetarium with musical performances curated by Dean Shelton Berg of the Frost School of Music followed by late night revelry as you join the gala guests on our interactive dance floor in the Aquarium. Proceeds from the event support the museum’s programs and exhibitions. Your participation impacts the next generation of scientists and supports a commitment to science learning, research, environmental conservation and animal rehabilitation. Frost Science Young Patrons with current memberships are eligible to receive a $25 discount on up to three tickets per cardholder by using promo code YPBB19. Must be logged-in to member account to receive discount. For more information, please email YoungPatrons@frostscience.org.